My holiday attire has gotten more and more casual over the years. And now that my granddaughter Summer has entered the picture, anything too fragile is definitely not an option. I am not a big fan of holiday apparel that can be worn only once or twice. 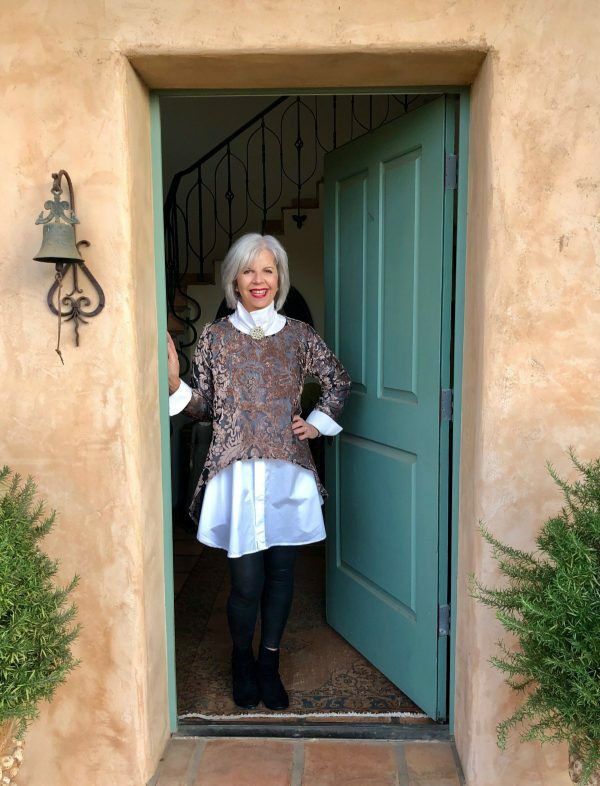 When Artful Home asked me to choose something from their Holiday Collection, I knew this Oleana Velvet Topper designed by Lisa Bayne would be a great option for me, as well as a wonderful over-50 holiday fashion choice. 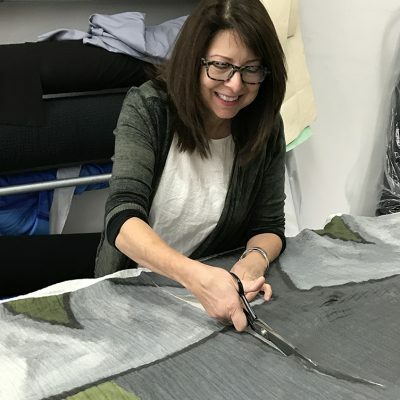 For the holidays, I will probably wear it with my all-time favorite shirt, the Artist’s Smock Shirt from Planet. You can read more about this fabulous shirt in my post “The Great White Shirt.” This shirt is worth every penny, and I always get compliments when I wear it (which is a lot). I added my favorite leggings, short suede boots, a vintage brooch, and rhinestone bracelets. The crescent hem makes it a great layering piece. I love the tension between the texture of the burnout velvet and the sparkle of the rhinestone jewelry. For a more casual look, I paired it with faux leather pants, my favorite black turtleneck, and a pair of leather boots. 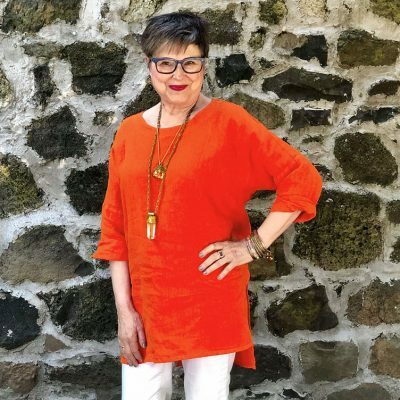 I think it would be equally fun with jeans (like the Runaround Sue Jeans from Artful Home) and a pair of suede boots as an everyday look. 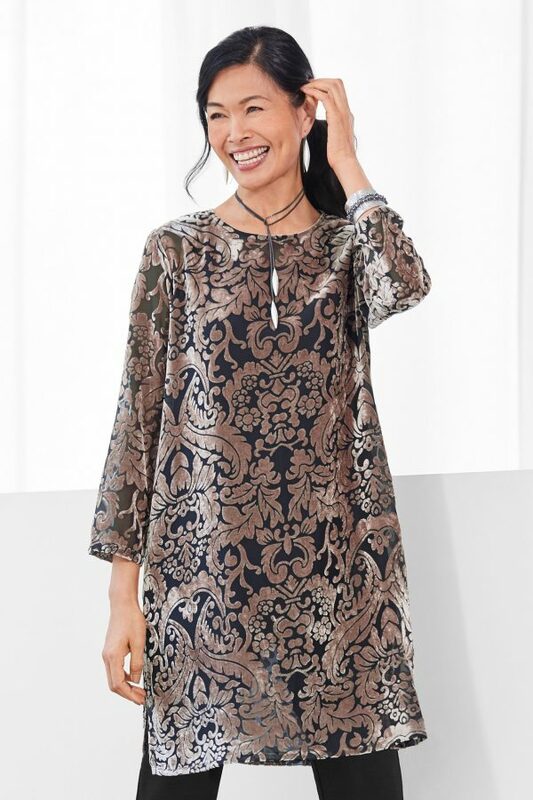 If a looser, flowier look is more flattering for your figure, I love the way Artful Home styled it on their gorgeous gray-haired model. I have a waist (barely), a curvier physique, and am not very tall, so this isn’t the best look for me personally. The longer Dream Tank covers all your assets, and the Crepe Wide Leg Pant completes the look. I would love to snag the gorgeous necklace and earrings. They are a perfect complement to this pretty ensemble. 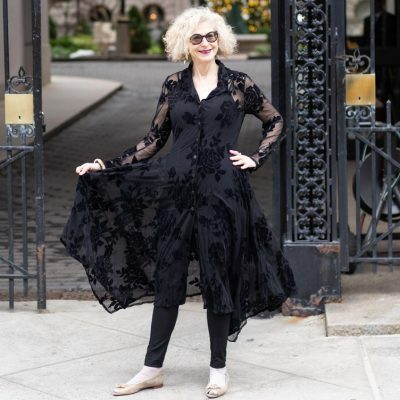 If you would prefer something longer, Lisa designed the Olivia Velvet Tunic in the same gorgeous burnout velvet fabric. It looks great with leggings. 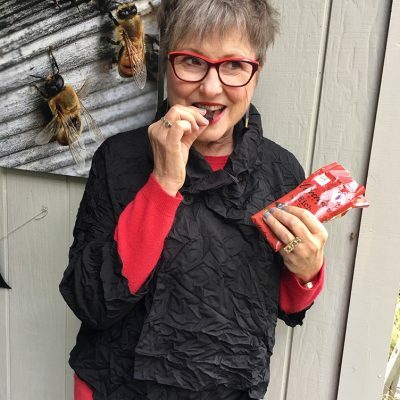 My pal Brenda Kinsel wrote a post on her personal site here, if you want to see what it looks like on her. While I love the elegance of the tunic, I opted for the versatility of the topper. Practicality, uses per purchase, and not wearing anything too fragile with this little one around are paramount to me at this stage in my life. 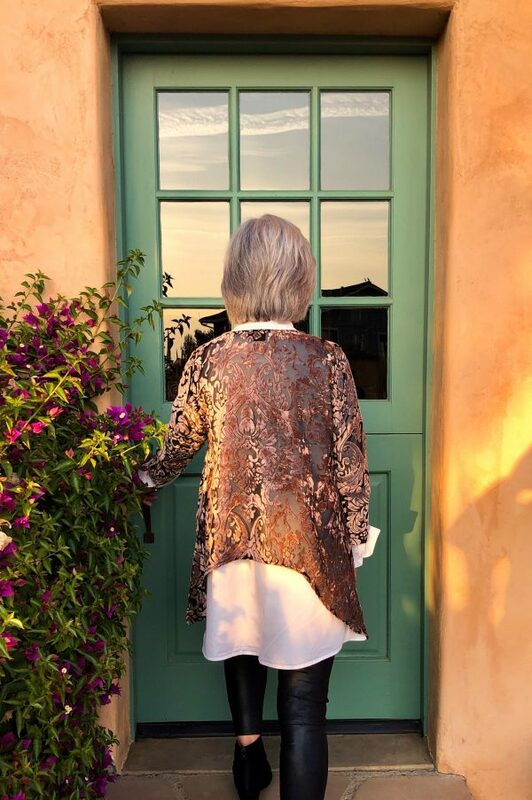 If you are looking for over-50 fashion fun, the Lisa Bayne Oleana Velvet Topper might be your ticket. If you liked this post and want to see more of my style and interior design tips, visit my blog, Rough Luxe Lifestyle. 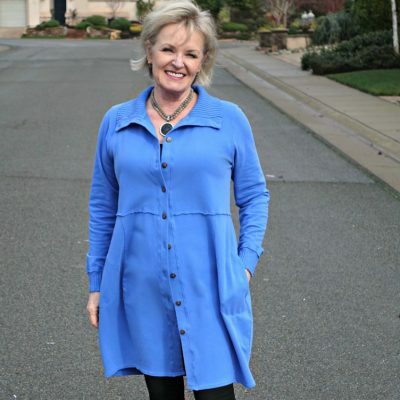 LOVED the way you styled the Oleana Velvet Topper, Cindy! That topper caught my attention as well. I wasn’t sure how to style it but I sure do now. I love both outfits. You’re right, you will get a lot of cost per wear with this piece! Thanks for the inspiration, my friend!